As soon as Apple started accepting pre-orders for the iPad, the product page for one of its most important component, iBooks was also updated. It’s not really surprising that Apple will highlight the iPad’s e-book reading features especially since this is a hot market right now. And besides how good is a new Apple product if it doesn’t have a competitor to taunt? Sorry Kindle fans, but whether you like it or not, Apple is taking on the Kindle’s dominance in the e-book market. Anyway, so what’s up with iPad and iBooks. Nothing much really, except for the fact that apparently the iPad can actually read e-books to you aloud. Â Yes, I know Amazon Kindle has this. But we all know that this feature has been an issue before with the Kindle. So, it’s kind of surprising that Apple decided to have this feature in the iPad. So, once the iPad starts rolling into the hands of those who pre-ordered it, expect some legal issues to arise once more. But I’m pretty sure Steve and his boys are more than ready for this. In a related note, another indication that Apple is really prepping up the iPad as a fierce Kindle competitor is the fact that the device will be supporting e-books in EPUB format which will not be sold from the iBooks E-Bookstore. 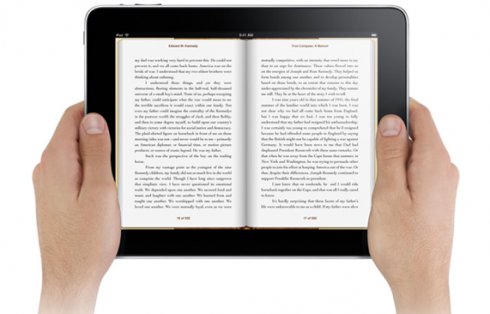 This simply means that you won’t be spending additional money to use your iPad as an e-book reader. You can practically load it up with free e-books that are freely available from various online sources. This is a welcome feature and is good for both Apple and iPad users who are planning to use their iPad for e-book reading purposes. For Apple, it will be able to capture an already established market – the e-reader market. And for iPad owners, it’s one less cost.